The Students’ Literary Club „Vox Napocensis” was established on 21 November 2001 as a continuation of the literary activities sustained at the Students’ Culture House. The initiative of establishing a new students’ literary circle was the co-operation of the cultural circles from Cluj-Napoca. The Students’ Culture House management has drawn up a viable project along with the local authorities, culture committees and the Writers’ Union from Romania in order to resume the cultural activities- under the Students’ Culture House from Cluj-Napoca patronage. This measure has materialized into the set up of the Students’ Literary Club „Vox Napocensis”. Thanks are owned to the administration department who has brought its contribution into the well being and organization that was much needed in the development of the cultural activities, cultural managers: Hodrog Laurenţiu, Victor Bercea, Ioan Cocean, Silviu Corpodean, Dumitru Fărcaş, Adam Laszlo, Flavius Milăşan and the cultural referents: Mariana Topan, Aneta Ilea, Cristina Topan, Monica Mureşan, Cecilia Stoica and the writer Petru Poantă, Constantin Cubleşan, Dumitru Cerna, Victor Cubleşan, Persida Rugu, Constantin Rusu. Along the fourteen years of activity, a number of around 1000 students has attented the club, students from all universities from Cluj- mainly from „Babeş-Bolyai” University, „Iuliu Haţieganu” Medicine and Farmacy University, Technical University, Art and Design University „Ion Andreescu”, University of Agricultural Sciences and Veterinary Medicine. The club’s meetings were weekly and bi-weekly. There were, however, special meetings according to the agreement between the writers, readers and future writers and lectors. The management of the Students’ Literary Club „Vox Napocensis” was assured, over these past ten years, by Victor Constantin Măruţoiu – president (2001 – present), Anca Hăineală (2002-2004) – vice-president, Adela Ciurescu – vice-president (2005-2008), Mihaela Ferlai – vice-president (2008-2009), Andrei Dullo – vice-president (2009 – present), Vlad Gartner Pintea – vice-president (2009 – 2012), Denisa Moldovan – vice-president (2014- present), Marcela Lăcrămioara Cocuţ (Vâtcă) – secretary (2001 – 2005), Oana Lascu – secretary (2006 – 2008), Sorana Ionăşanu (2008 – 2009) – secretary, Daniela Cristiana Bota – secretary (2009 – 2012), Maria Birtocean – secretary (2012-2014), Sebastian Rus – secretary (2014- present). Every year, the Students’ Literary Club „Vox Napocensis” organizes, for students and pupils, a national contest of literary creations on three segments (poesy, proses and theatre). This contest has had 14 editions gathering over 1000 contestants and over 200 awards given. The jury was formed, along the years, by writers and cultural critics: Constantin Victor Cubleşan – jury’s president, Radu Constantinescu – member, Constantin Cubleşan, Constantin Rusu – member, Nicolae Benea – member, Victor Constantin Măruţoiu – member. The members of the Students’ Literary Club „Vox Napocensis” have attended different literary meetings, debates, books launchings. The club’s members have received several prizes at different national and international contests: Victor Constantin Măruţoiu: Special Award – International Festival of Literary Creation „Lumină lină”, First Edition, Timişoara, 24 September 2004, Grand Award „Dosoftei” – International Festival of Literature „Lumină lină”, Ediţia a IV-a, Timişoara, December 2007, First Mention – Poetry Contest „Juventus” 2010, Piteşti, 5 August 2010, Second Award – Poetry Contest „Juventus”, Piteşti, 2012, Award for Poetry for the Volume „Paşii ochilor de seară” 2012 – League of Romanian Writers, 30 May 2013, National Poetry Award „Titu Rădoi” – National Poetry Studio „Serile la Brădiceni”, seventeenth edition, 2013; Andrei Dullo: Second Place- National Contest of Literary Creation “Marin Sorescu” Rm. Vâlcea, proses, with the text “Grădina Iadului”; (2008), Mention – National Contest of Literary Creation “Marin Sorescu” Rm. Vâlcea, proses, with the text “Pseudom” (2009), Third Place – Essay Contest “Zilele Gulagului Românesc” Dej-2010, with the text “Tribut către fericire” (January, 2010), Third Place – Contest “Student Creation” of Sibiu Students’ Cultural House, February 2011, Sorana Ionăşanu: Second Mention – Poetry Contest „Juventus” 2010, Piteşti, 5 August 2010; Dan Sebastian Chertes: First Award, proses – Literary Contest „Pavel Dan”, Timişoara, 2002, Adela Ciurescu: Second Award, poetry – Poetry Contest „Juventus” 2008, Piteşti, 2008; Mădălina Onea: Mention – Poetry Contest „Juventus” 2008, Piteşti, 2008, Maria Patricia Birtocean: First Place – National Contest „Juventus”, June 2011, Second Place – National Contest „Juventus”, 2013, Roxana Toşu: Second Place – Contest „Traian Brad”, Cluj-Napoca, 2011, Grand Award TiMAF (Transylvania International Music and Art Festival), Cluj-Napoca 2012, Ioan Emanuel Gruia: Third Place – Contest „Premiile Ars Poetica 2014”, Călăraşi 2014; Linca Kucsinschi: Second Place – National Festival of Essay and Poetry „Octavian Goga”, Thirtieth Edition, Cluj-Napoca, 2014. Major accomplishments: the publishing of Raluca Delia Pop’s volume called „Taine”, publishing house „Napoca Star” which was launched at the „Octavian Goga” Library, May 22, 2003, the publishing of Roxana Toşu’s volume called „Templul de gheaţă”, publishing house „Şcoala Ardeleană”, Cluj-Napoca 2014, the publishing of Andrei Dullo’s volume called „Palimpsest oniric”, publishing house „Şcoala Ardeleană”, Cluj-Napoca 2014, the publishinb of the Anthology „Vox Napocensis”, Editura „Limes”, Cluj-Napoca, 2011 where 15 of the club’s members were included among the award winners of the Literary Creation Contest „Vox Napocensis”. 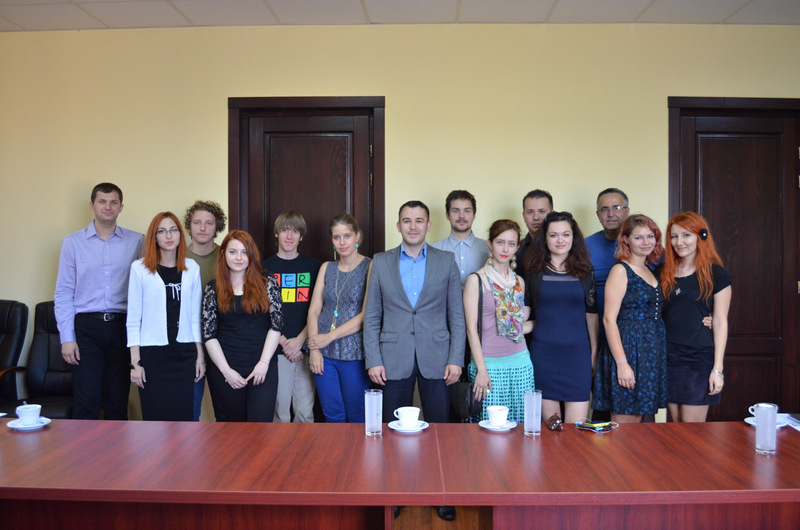 The Students’ Literary Club „Vox Napocensis” has supported the collaboration with various literary clubs „Constantin Brâncuşi”, „Octavian Goga”, „Haiku”, „Satiricon”, „Nicolae Tăutu”, „Vasile Sav”, „Traian Brad”. At the same time there were formed strong connections with publishing houses from Cluj and with mass-media (TVR1, Antena 1, NCN, PRO TV, Radio Cluj, Radio Renaşterea, „Făclia”, „Steaua”, „Tribuna”, „Oraşul”, „Verso”, „Tabor”). The critical and esthetical approach of the club was made by Michaela Bocu – „Făclia” –year XXII, nr. 6329, 24 August 2011, p.7. Every year, on January 15 the Students’ Literary Club „Vox Napocensis” has organized „Serată de poezie şi muzică” along with the referent Mircea Câmpean from Sibiu Students’ Culture House and the classical music trio “CANTABILE”. In memoriam of the poet Lucian Blaga it was organized in May 2011 a poetry and music night in partnership with „Trio Cantabile” called „Blaga i.m.”. Other activities: „Serata întrunirii tuturor cenaclurilor literare din Cluj-Napoca”, 15-20 May 2008, organizing the debate „Tendinţe în literatura secolului al XXI-lea”, 4 March 2009, „Valoare şi non-valoare în scriitura modernă şi contemporană”, 8 April 2008, attending the International Poetry Competition Castello di Duino, 2007-2009. The club’s members have published poems in various magazines such as: „Steaua”, „Verso”, „Glasul”, „Cetatea culturală”, „Drumeţul incendiar”, „Juventus”, „Vestitorul”, „Viaţa de pretutindeni”, „Nord literar”, „Dor de dor”, „Caietele Columna”, „Lamura”, „Floare de latinitate”, „Baaadul literar”. The Literary Creation Camp „Vox Napocensis” first edition (Costinești September, 7-12, 2014) had as purpose the reunion of the most promising young writers. On December 16, 2014 at the Students’ Culture House were held the events dedicated to the „Vox Napocensis” Galas, an action initiated by the Students’ Literary Club „Vox Napocensis” where 50 people have attended. Some of the most prestigious guests were: Victor Cubleşan, Constantin Rusu, Dorel Găină. Conversations about the literature’s situation in the XXI-st century were held, as well as talks about the relation between young writings and universal models that should be followed. The Students’ Literary Club „Vox Napocensis” of Cluj-Napoca has been gradually self-developing, managing to obtain a well-deserved appreciation of its literary work. There is today, more than ever, the necessity of forming the tomorrow literary generation.